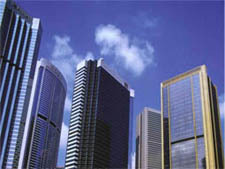 The Architectural Cladding and Curtain Wall Division (ACCW) offer unique solutions for cladding, building facades and interiors including complete curtain wall systems. ACCW focuses on the building and construction market for providing complete solution for Aluminium Composite Panel (ACP) cladding and curtain walls. ACCW provides a variety of Aluminium profiles in different colors to suit a wide range of applications including curtain walls, doors, and windows. Glass, being an integral part of curtain wall, doors and windows are also available in tasteful colors. Our business focus is to provide turnkey solutions beginning from the concept up to the installation by working closely with architects, designers, project owners and contractors. ACCW provides architects and designers and opportunity to give new dimensions to their projects, break through the clutter of traditional finishes and give urban skylines a modern look.